It is the world's largest nocturnal primate, and is characterized by its unusual method of finding food: it taps on trees to find grubs, then gnaws holes in the wood using its forward slanting incisors to create a small hole in which it inserts its narrow middle finger to pull the grubs out. This foraging method is called percussive foraging, and takes up 5–41% of foraging time.The only other animal species known to find food in this way is the striped possum. From an ecological point of view, the aye-aye fills the niche of a woodpecker, as it is capable of penetrating wood to extract the invertebrates within. Due to its derived morphological features, the classification of the aye-aye has been debated since its discovery. The possession of continually growing incisors (front teeth) parallels those of rodents, leading early naturalists to mistakenly classify the aye-aye within the mammalian order Rodentia and as a squirrel, due to its toes, hair coloring, and tail. However, the aye-aye is also similar to felines in its head shape, eyes, ears and nostrils. The aye-aye's classification with the order Primates has been just as uncertain. It has been considered a highly derived member of the family Indridae, a basal branch of the strepsirrhine suborder, and of indeterminate relation to all living primates. In 1931, Anthony and Coupin classified the aye-aye under infraorder Chiromyiformes, a sister group to the other strepsirrhines. Colin Groves upheld this classification in 2005 because he was not entirely convinced the aye-aye formed a clade with the rest of the Malagasy lemurs, despite molecular tests that had shown Daubentoniidae was basal to all Lemuriformes, deriving from the same lemur ancestor that rafted to Madagascar during the Paleocene or Eocene. In 2008, Russell Mittermeier, Colin Groves, and others ignored addressing higher-level taxonomy by defining lemurs as monophyletic and containing five living families, including Daubentoniidae. Further evidence indicating that the aye-aye belongs in the superfamily Lemuroidea can be inferred from the presence of petrosal bullae encasing the ossicles of the ear. However, interestingly, the bones themselves may have some resemblance to those of rodents. The aye-ayes are also similar to lemurs in their shorter back legs. The aye-aye is a nocturnal and arboreal animal meaning that it spends most of its life high in the trees. Although they are known to come down to the ground on occasion, aye-ayes sleep, eat, travel and mate in the trees and are most commonly found close to the canopy where there is plenty of cover from the dense foliage. During the day, aye-ayes sleep in spherical nests in the forks of tree branches that are constructed out of leaves, branches and vines before emerging after dark to begin their hunt for food. 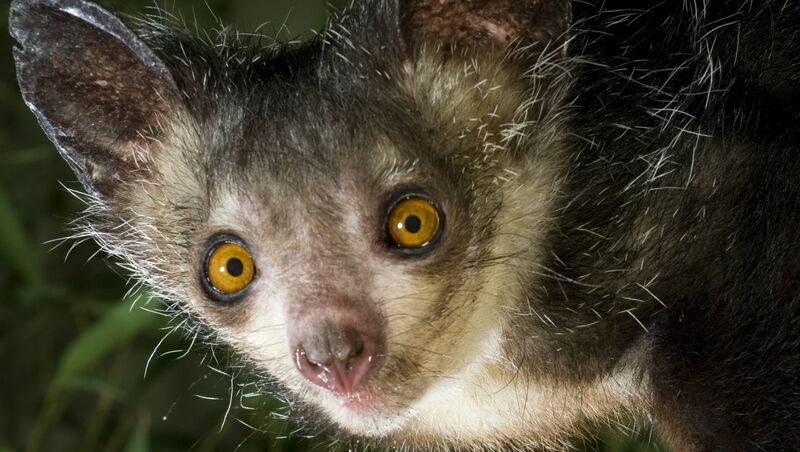 Aye-aye are solitary animals that mark their large home range with scent. The smaller territories of females often overlap those of at least a couple of males. Male aye-ayes tend to share their territories with other males and are even known to share the same nests (although not at the same time), and can seemingly tolerate each other until they hear the call of a female that is looking for a mate.